These brackets were announced by Abingdon within their January 1933 Service Information Sheet having received numerous complaints from customers regarding mud being deflected onto the windscreen during bad weather. The factory therefore produced a special bracket to move the headlamp postion inwards towards the radiator, thus altering the car's aerodynamics. Late J2 wingstays overcame this problem as the wingstay patterns were modified to incorporate longer headlamp stems. These are not straightforward to manufacture in all their detail to include a close tolerance fit to the radiator crossbar and arms having the correct crank to meet up to the horn mounting lug on each stay. This has necessitated designing tooling to overcome all of these issues and may explain why this part has not been reproduced for many years. 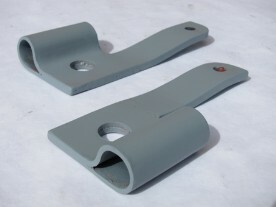 Customers who wish to fit these brackets to non-VMGP reproduction wingstays will need to reshape the crank position on the arm as it should be noted that repro wingstays do not have the securing lugs in the correct position although this is a point that VMGP will be addressing during the manufacture of our own wingstays. For those customers wishing to fit the slightly larger L150 Lucas headlamps (9 inch diameter), we can manufacture brackets with shorter arms.